Your microbial cloud is your "signature"
Humans are walking ecosystems. Each of us carries around about 100 trillion microbes in and on our bodies, which make up our microbiome. The quality of this bacterial community has a lot to say about our health and well-being. The blend of microbes is also surprisingly unique, which says a lot about who we are as individuals. Scientists have already amassed plenty of information about the human microbiome and they already know that people disperse some of those bacteria to their environments. 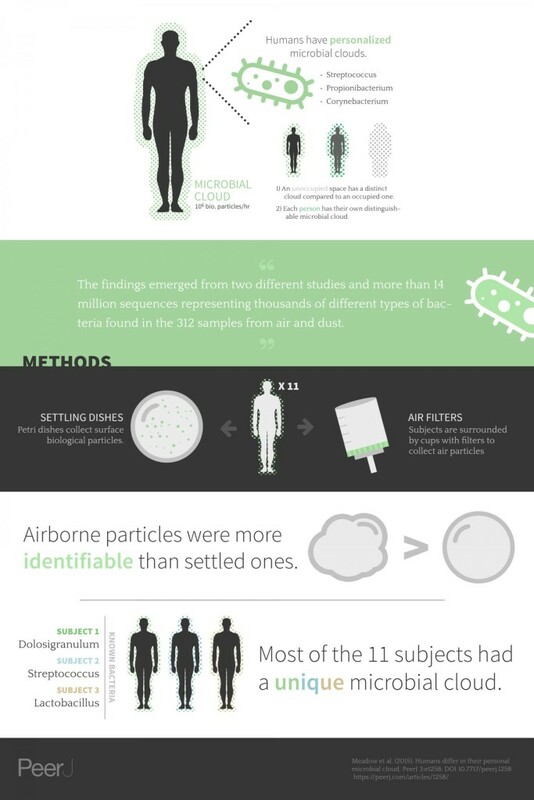 These microbes come primarily from dust, our clothing, and our bodies. Two new experiments, conducted at the University of Oregon, investigated the individual nature of these bacterial clouds. The first experiment was designed to test whether researchers could confirm the presence of a person based only on bacterial traces. The researchers asked study participants to sit alone in a sanitized chamber that was filled with filtered air. A second, unoccupied chamber was used as a sterile control. Each participant was given a clean outfit to wear to reduce the number of particles coming from clothing. Participants also sat in a plastic chair that had been disinfected and were given a disinfected laptop to use for communication and for personal entertainment during the study. The experiment involved three participants, each tested for a total of six hours. Air in the test chamber was compared to the air in the unoccupied chamber. Any particles that came from a participant were filtered out of the chamber air and genetically sequenced to identify the mix of bacteria. The analyses involved thousands of different bacteria types in over 300 air and dust samples. The researchers were able to determine that a person was present in the chamber after two hours, based only at the presence of bacteria in the air samples. They also found, however, that they could distinguish one person from another based on the unique combinations of bacteria from each participant. This result motivated a second, more precise experiment. Eight new people were asked to sit alone in the chamber for two 90-minute sessions. Analyzing the bacteria in the air revealed several individual features of each participant, including whether the person was male or female. (found on the skin), were primary indicators in the study. While these microbes are common in humans, it was the different combinations of these bacteria populations that distinguished between individuals. Subtle differences were also found in the microbial clouds. Some people, for example, gave off different amounts of bacteria to the air due to such personal habits as how much they scratched and how much they fidgeted. The demonstration that bacteria clouds can be traced to individuals could shed light on how infectious diseases spread in buildings. The results could also have a forensic use. Bacterial residue in the air might, for example, be used to determine where a person has been, even after they’ve left a space. The contributions of other people – or even animals – in those spaces, however, could easily complicate any analysis, so forensic uses will likely require more research. Many things are used to detect and identify us in modern life. Now we know that the bacteria on, in, and around each of us has a close connection to the places we occupy, can be detected even after we’re gone . . . . and can be traced back to us.